This past weekend we enjoyed a quiet shabbos dinner with one of my favorite dishes, my wife’s Lemon Rosemary Pepper Flake Roasted Chicken Recipe. Along with the roasted chicken we made some lovely quinoa and fresh green salad. To pair with the chicken and quinoa I opened a bottle of the 2009 Dalton Viognier, Reserve, Wild Yeast. Six months ago we opened one of our two bottles of this lovely Viognier elixir and it was tasting fantastic then and it is tasting great right now! It is a bottle that I have really loved for sometime and one that Dalton stopped making after the 2009 vintage. As stated here, the great news is that I tasted the new 2012 Viognier and it was awesome and it should be on the market in the next year or so. Until then we must wait and live with whatever Dalton Viognier you may have laying around or get a bottle of the 2009 Yatir Viognier. Personally, I found the bottle to be great, even though others have said the bottle is dead or dying. It was because of these statements that I must come out and state whole wholeheartedly that “the reports of its death are greatly exaggerated”! The wine tasted lovely, it was bright, and rich with lovely summer fruit and I miss it already as it was my last bottle. Yes, I am having serious withdrawal issues, and I only finished drinking it a few hours ago. Till the new Dalton Viogniers come out, I will have to drown my sorrows in a bottle of Yatir Viognier, Teperberg Viognier, or Midbar Viognier. The other options; Yarden Viognier is too Yarden (oak), the Galil Viognier was OK (as told here), and the 2009 Goose Bay Viognier is nice but I hope they will be pouring a new vintage at the Kosher Food and Wine Experience and/or at the International Food and Wine Festival. In the end, other than the Yatir Viognier, Teperberg Viognier, Terra, or the Midbar Viognier there really is no other kosher Viognier out there that is in the same league. It makes me so happy that the Dalton Viognier is coming back – so look for it very soon. The nose on this light gold orange haloed colored wine is expressive with honeysuckle, butterscotch, toasty oak, floral notes of jasmine, peach, and apricot, with the honey, toast, lemon, and butterscotch showing itself more expressively over time. The mouth on this full bodied wine is rich and oily, layered, and textured with cut grass, grapefruit, melon, summer fruit, pineapple, all balanced well by bright citrus and acid, and mouth rounding oak. The finish is super long and spicy with smoky notes, caramel, cinnamon, rich honey, and candied fig. 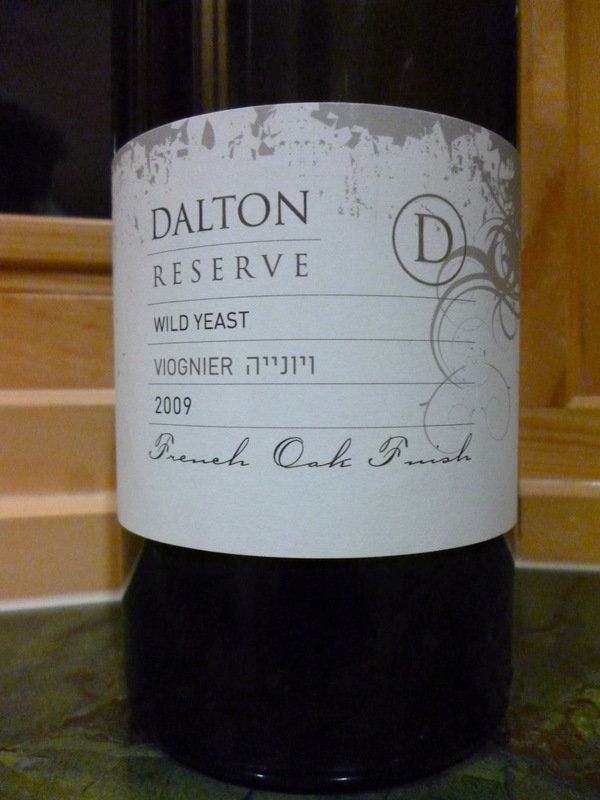 Posted on January 19, 2013, in Israel, Israeli Wine, Kosher White Wine, Kosher Wine, Wine and tagged Dalton Winery, Reserve, Viognier, Wild yeast. Bookmark the permalink. 6 Comments. kosher wine.com still has some. Just received 2 fresh bottles of 2009. It is still great! but like you I’m looking forward to the next vintage and glad they are not going with the Alma with. The bottle my wife and I had last night had a touch of frizzette ! Will have it again tonight with roast chicken/rosemary/garlic. Thanks for the post Shai and the shout out for my wife’s chicken recipe. We will be enjoying the chicken recipe as well this Shabbat. Stay warm and have a great and fulfilling Shabbos enjoying a fine wine and food with your wife! Have you tasted the 2009 Yarden Viognier? If so, how is it? Do you recommend it? What about the domaine netofa white 2010? What about eagles landing 2009 Russian river chard? The reason I ask is because I just found a few bottles of these and I wanted to know if they were still in their drinking window and worth buying? I also found a few reds netofa tinto 2011, Elvi mati Rioja 2010, makor de elvi wines 2007, Carmel appellation carignan 2007? As always thank you for your help and opinion. LOL! That is a lot of wines! OK, to me the 2009 Yarden Viognier is past peak. Viognier, kosher anyway, is not built for super long aging. The 2010 Netofa white is at peak – drink up! The Russian River is fine, but drink up as well. Of all these three wines – I would not buy them today, but if you have them – start enjoying now! The Netofa Tinto 2011 is LOVELY, if held well – and worth finding and drinking – it is at peak! Elvi Mati 2010 is beautiful as well, start drinking. The Makor is not fun any longer – move on. The carmel app 2007 is also past – sorry. happy to help! Great. Thanks for be advice. The wine store in town just took a bunch of wines out of be stock room and I wasn’t sure if it was worth trying them. They were under $10 each.